To view each pictures, click the title of each terms. Odori means "dance". Yakata has the sence of "precious house". Odori-Yakata is the stage of instrument player and singer of Gujo-odori dance. I took this picture while dancing. The place of Gujo-Odori dance is changed every day. 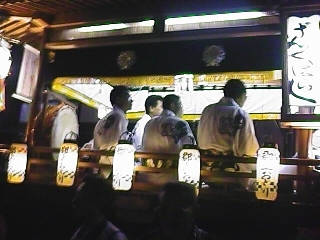 So, Odori-Yakata is carried from the center of town to the area of dancing every day. 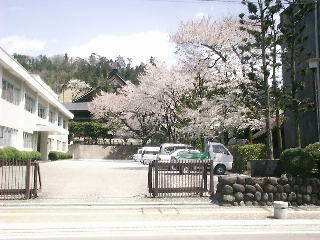 Cherry blossoms are represental in Japan. This picture was taken a vacant lot in front of the district court of Gujo. There is a loof over these blossoms. It is "An'yoji Temple". And I hope you can see a building in the top of mountain. It is Hachiman-jo catsle. 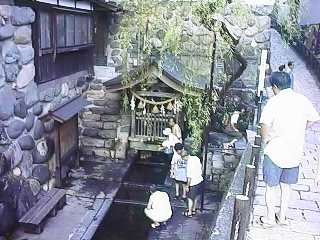 Gujo-Hachiman has many springs of clear water. Sougisui is most famous one among these and is authorized to one of the clearest water in Japan by Japanese goverment. The name "Sougisui" means "the water of Sougi". Sougi was famous poet in the middle age of Japan. It is said that he loved this spring. 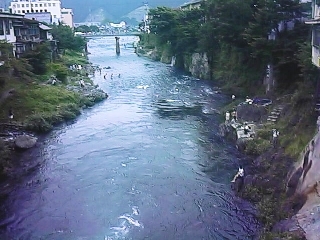 This river flows in the center of Gujo-Hachiman town. In summertime, courageous(?) children dive form the bridge over this river, whose height is almost 10m. This diving is one of sightseeing attractions.